I didn't see the why at the link, but I think it's pretty clearly "fouls". In other words, the team that's behind with about 40 seconds to go starts to foul to try to come back (more posessions + hack-a-Shaq variants). Generally, when this strategy is pursued, either the team that was a little ahead (3-4 points) makes their free throws and the lead grows to a lot ahead (8-12) and the team stops fouling (futile). Or the team that was behind catches up (ties the game) and then stops fouling. Thus there are two equilibrium states to the fouling strategy - tied and large lead. Pedantic note: one too many "occur" or one too few "that" in the first sentence. I think the puzzle stems from the dynamics of the game. Very close games are the exceptions. The vast majority of games will not be close. And who will win is clear fairly early. As the teams sense that a game will be not close they play differently. When the winner and loser become certain - one gets an insurmountable lead - the remainder of the game is pro forma. At some point the winner will try to run out the clock. But when the loser has the ball some players will try to score no matter how hopelessly they trail. Individuals want those points and rebounds on paper at the end of the season. They have no orders to delay. But why would winners run out the clock? Don't winning players want to boost their stats too? Well, yes they do, but the coach says eat up time and that is what they do. There are endless possible scenarios. But my point is that an insurmountable lead changes the remainder of the game. And a normal curve shouldn't be expected. Well, the answer has to be that, late in the game, if the score is tied, *both* teams act to keep it that way, at least on average. Think about it. It makes sense. There's ten seconds left in the game, the score is tied, and you are at half court. What do you do? Shoot for a three? To risky. Remember the game is tied. All you have to do is dribble for ten more seconds and you get a hell of a lot more time to break the tie. So, if you attempt to score, you want to make sure it's a pretty high percentage scoring opportunity, and you don't really want to risk fouling the other team in the process. Those sorts of opportunities tend not to present themselves in 10 seconds. So most likely you are going to let the clock run out without scoring. From the other team's perspective, the last thing they want to do is foul - again, the score it tied, all they have to do is wait ten seconds - why risk fouling you, giving you two points, and then having less than 10 seconds to attempt a low percentage three point shot. They best they could reasonably hope for would be to get back to a tie. So any fouls this late in a tie game would be purely accidental. So basically, a late game tie is a stable solution, in that it dramatically decreases the incentive for both teams to score and or foul. Chris - it's the distribution of [(home team score) - (visting team score)]. There's a skew to the right because of home court advantage. Jody, you nailed it on the head. If a team is behind by more than just a few points in the last minute or two, it starts to take risks by fouling on every possession. The two most common scenarios of this are polar opposites: a) the team ahead keeps making free throws and extends its lead; or b) the team ahead misses some free throws and the other team has a good chance to catch up. 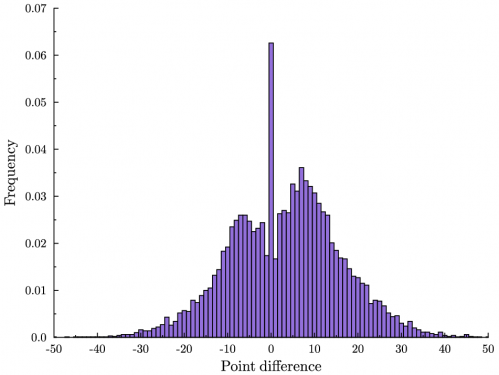 Even if scenario b) partially occurs and the team ahead misses only a couple free throws, it typically reverts after that point to scenario a) because the team behind keeps on fouling until it gets to a point where they are within three points (if there's less than 24 seconds to go, the maximum amount of a possession) or they are so far behind that fouling would be ridiculous. It all depends on the amount of time left, so they factor in the approximate number of possessions left and whether they could catch up if the team ahead simply missed its remaining field goal attempts and the team behind put up threes and made them. Essentially, the team behind by more than just a few points at the end is compelled to take great risks, while the team ahead stalls, using up the clock as much as possible, and gets sent to the free throw line over and over. It's pretty boring stuff compared to the regular action during the game, which is rather ironic since the end of the game should be the climax.